For years, people promoting the mantras of ‘constructive engagement’ and ‘bridge-building’ with Israel have cited Professor Noam Chomsky in their defence. He is alleged to oppose the campaign of Boycott, Divestment and Sanctions (BDS) launched by Palestinian civil society in 2005. 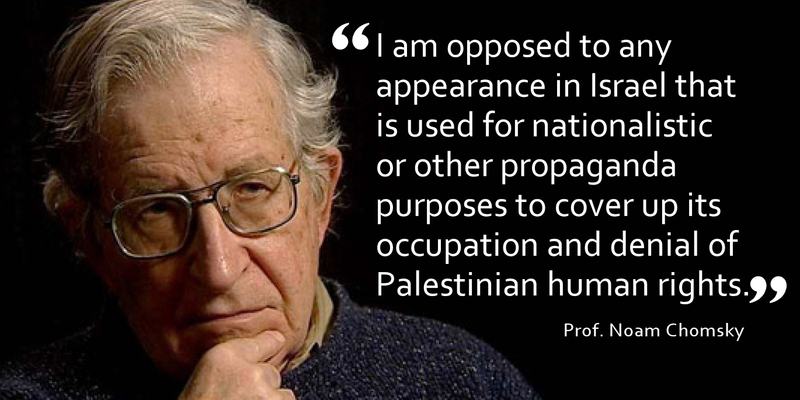 Artists for Palestine UK contacted Professor Chomsky to ask him to clarify his position. APUK thanks Professor Chomsky for his clarification, and respectfully draws the attention of any artist contemplating performing or exhibiting in Israel to the essential point he makes: that the presence of international artists in Israel is used by the government to cover up its occupation and human rights abuses. Radiohead dismissed appeals from Palestinians and artists around the world to cancel their Tel Aviv concert in July this year, with singer Thom Yorke arguing that Radiohead did not ‘endorse Netanyahu’. But as APUK has shown, Netanyahu’s government certainly endorsed Radiohead, with Israeli politicians and diplomatic missions loudly promoting the group’s anti-boycott stance. All major artists who appear in Israel are likely to find themselves similarly hailed, with every performance considered a victory by Israel’s apartheid regime. We hope that Professor Chomsky’s clarification encourages international artists to respect the call from their Palestinian counterparts to refrain from performing in Israel until it ends its violations of international law.